Last night I was fortunate enough to be invited to the kickoff party for the Southbank Centre’s Imagine Festival – a two-week celebration of reading and storytelling sponsored by The Book People. 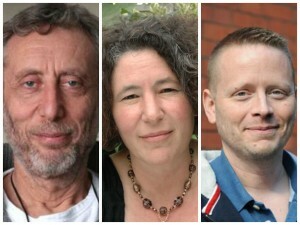 Three iconic authors were invited to speak to the assembled great and good of children’s publishing. Michael Rosen rightfully articulated the need to allow kids to develop their interpretation skills – and not just their retrieval and comprehension skills. Francesca Simon shared a cautionary tale of how learning to read is hard, and how parents (like me, helping my four year old on the ‘bunny slope’ of reading) should be careful not to turn reading for pleasure into a chore. Patrick Ness closed by arguing that no other group of artists is asked to be advocates as much as children’s authors/illustrators; but that our power comes not from protesting or advocating, but from telling the world’s best stories that empower our readers. It was a rousing call to write stories that matter; stories that give kids, especially teenagers, hope, courage, and confidence – stories that give them power. The packed house of uber-talented children’s authors (I was able to catch up with Emma Dodd, James Dawson, Emily Thomas, David Sinden, Jennifer Gray, Phil Earle) cheered in agreement. Children’s author wishes he could have gone on a killing spree. The Cherub author lashed out against ‘lefties’ with a childishly selfish half-argument against people whining about wanting to help people they’ve never met. 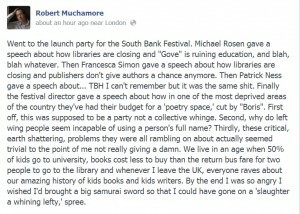 In his rant, Muchamore shows his nasty nature, an ‘I’m all right Jack’ selective ignorance, willingly blind to the families that can’t afford books (even if they are inexpensive) or worse have a family or neighbourhood bias against reading books – a ‘you think you’re so smart’ anti-effort mentality. I’ve spoken to kids in rough schools who’ve shared that they’d get beaten up for reading books in front of their ‘friends’. Good schools and accessible libraries matter – they are some of the first stepping-stones on the path to productive adulthood. Now, I’m an unabashed free market capitalist. I believe the free market is the best system we’ve discovered for distributing scarce resources and incentivizing people to contribute to society. But I also believe in market failure – that left unchecked, unregulated, and unsupervised, the free market will devolve into anything but. Concentration of market power leads to monopoly, markets get distorted and abused without oversight, and some ‘public goods’ like roads, schools, and armed forces can only be funded if everyone chips in via a tax system. Only government can provide the necessary checks on market capitalism. While there’s lot of differences between what’s call the ‘right’ and the ‘left’, for me the biggest delta is the degree to which people believe intervention is necessary to prevent market failure. Under Britain’s current government, we’re facing catastrophic market failure. Where do good schools and libraries come in? They are tools of social mobility – the ultimate adjustment to market failure. Enabling children to have a great start in life – via education – sets them up for success in the future. Yes, we celebrate the against-the-odds success stories of people who escaped poverty to become wealthy, but these are the outliers. But the science shows that people who start poor, stay poor. Education is the one lever that makes a difference. Giving children high quality, free education (and getting them ‘ready to learn’ from a very young age: nutrition, access to books, alphabet and basic numeracy as a toddler) offers a chance for social mobility – especially in our connected world where science & tech skills have never been more crucial. I believe that community libraries and school libraries are a vital part of that social mobility platform. They are part of an ecosystem that helps people help themselves. They are safe spaces for children to seek refuge from playground bullying and distracting home life. It’s actually a powerful and persuasive argument because in a free market system, it’s not economically optimal to subsidize someone else’s success. But, that thinking leads not just to colossal market failure, but societal collapse as well. Ignoring and disenfranchising people because they can’t afford books or send their kids to private school is the type of social fracturing that quickly leads to riots, generational unemployment, and revolution. Along the way, the middle class (the consumer class) that companies and pension funds rely on to keep the economy spinning gets hallowed out and GDP growth sputters. The Conservative transition we’re living through now, and (not successfully) fighting against, is an attack by the wealthy on the poor that is a self-serving, but ultimately suicidal, threat to social mobility. 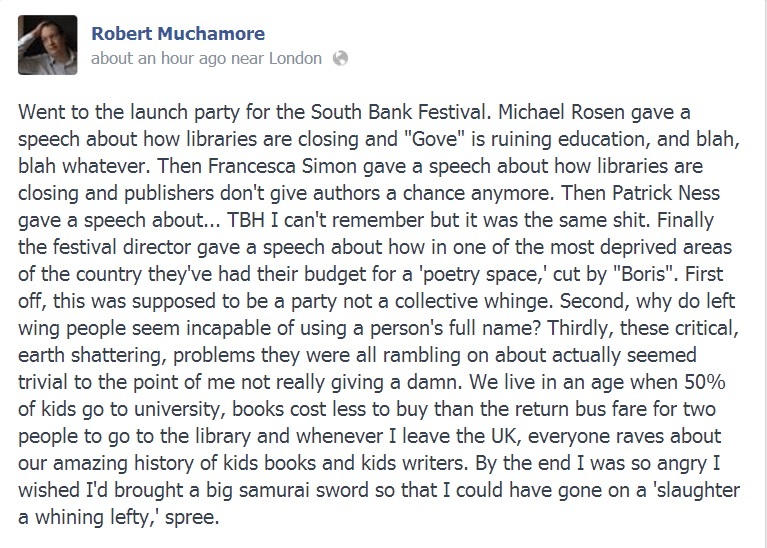 I’d never seek to curtail free speech; it’s the safe guard of democracy and frankly makes life interesting, but I do wish that if Robert Muchamore isn’t interested in supporting and saving the schools and libraries infrastructure that have contributed to his financial success, and the individual social mobility of a generation of children, that he’d just stay home, shut up, and write more books. At least then, to Patrick Ness’ point, he’d be giving power to his readers instead of adding fuel to the engine that’s bulldozing the school and library infrastructure that helps to make Great Britain great. For me the debate isn’t a political one. Access physically/digitally/however to the literary genius that we have today ought to be high on everyone’s agenda. It’s hard to stand on the shoulders of giants if you are ignorant of where the giants got to in the first place. Or more practically, everyone ought to have the opportunity to escape with a good read. Jeff, I wanted to read your post because I had the same debate with some of our alums last year. Kids who have digital books still love to visit libraries. It isn’t about transportation costs and quantifiable ROI. It is about experiences and interactions, and communities valuing literacy and ideas. They are foundational to good citizenship, innovation and personal growth. Thanks for getting your voice out there. The tragedy was, three very clever creative people stood up and moaned, without proposing a single creative and economically viable solution. If you want a protest to work, you can’t simply bang the drum and demand more resources, because all you’re doing is joining a vast queue of other people demanding more resources in other areas. The challenge is to find cheap and intelligent ways ot getting great books and learning resources into the hands of every child, and I didn’t hear a single word about how to do that. Just a lot of negativity. If you’ve written somewhere about possible “cheap and intelligent ways ot getting great books and learning resources into the hands of every child” – even if they are just back of the envelope ideas, brainstorming – could you tell me where please? If you haven’t, is it reasonable to criticise others who haven’t (on this particular occasion) articulated possible solutions? More generally, should any debate only take place when those speaker have solutions? Isn’t there a space for a call to arms, thinking aloud, describing the situation, and all sorts of other things that make for interesting and informed debate? Well said Zoe! And how about it, Mr Muchamore? I have been a school librarian for 20 years, and know a lot of other school librarians. We would all love to hear your intelligent solution to this. And please don’t say something like “Put a Kindle into the hands of every child’ without also providing a costed proposal to provide free broadband to all families and also provide enough credit for those children to download enough books throughout the year to satisfy their reading habits. Including the children who run to 6-10 books a week. Alternatively, of course, for much less money than this, you could just support school and public libraries which put both actual and eBooks into the hands of every child free, or for a cost far, far less than any other proposal that I, or any other school librarian, has yet seen. Please do show me a more intelligent and cost effective solution than public and school libraries which are free to use for every child. Thank you.